Yes, even with the craziness of preparing my WildArt Mongolia Expedition Kickstarter project, I continue to work at my easel. And I just finished this one late last week. Pokey Park and I and our guide/driver were exploring the wetland area of Gun-Galuut Nature Reserve, when we saw a local herder coming past us. 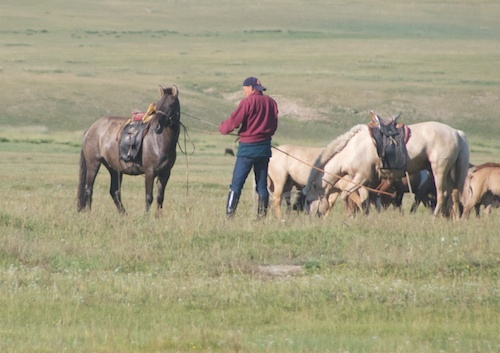 One of the impressive things about Mongol riders is that, even at a very young age, they can ride a horse going pretty much at any gait or speed standing up and utterly still. He rode on past us and we continued birdwatching and picture taking. Not too much later though, back he came, catching up with a brown horse, saddled and bridled, which had clearly gotten loose. In the meantime, a good-sized group of horses were heading for some open water. The brown horse dodged behind them with the rider right after him. Up came his urga (the long pole with a loop that is used instead of a rope lasso) and in short order the brown horse was captured. For the painting, I wanted to show Mongol horsemanship, which most people haven’t seen. The bonus, of course, was the great morning light and the setting. 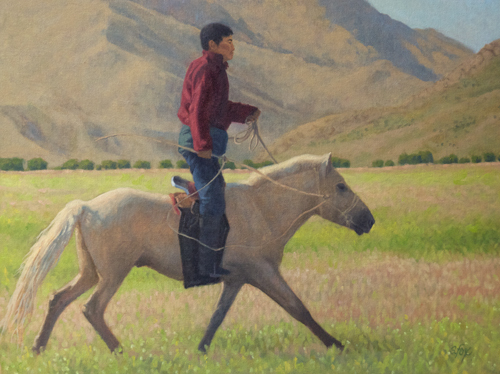 And…you may have noticed that the rider in the photo is wearing backwards baseball cap, but not in the painting. I’m interested in painting the Mongolia of today, but the baseball caps just don’t do it for me, however practical they are for the wearers, so I leave them off. But everything else is as I saw it that beautiful morning in August 2011.